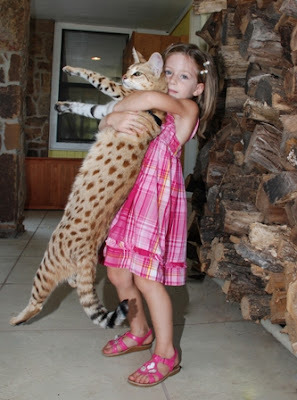 F1 Savannah Cat MAGIC is a video in large format of this stunning cat. The video is on a separate unformated page as it is in large format….This cat is possibly, probably, the world’s biggest domestic cat other than tame wild cats. Update 22-9-09: Guiness World Records™ has confirmed, I am told, that MAGIC is the tallest domestic cat at 43.43 centimeters (17.1 inches) high, toe to shoulder. Watch this space to find out if she is the longest and therefore the biggest too…update: Magic is described as the “largest pet cat in the world” on the A1 Savannahs website. A1 Savannahs, as you might know, raised Magic. What an achievement. MAGIC is a 16 month old (at the date of this video 6th Sept 2009) spayed female Savannah cat. Her father is a Serval. 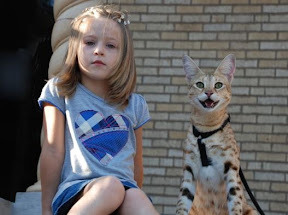 Her mother is a Savannah cat. She now lives with Kimberly and Lee Draper who own and manage Bella Gattini Cattery. They also own and manage The Savannah Cat Shoppe where you can see MAGIC. This is a 1,543,902 views video at June 2011 – if you see one of these, see this one. This entry was posted in Cat Breeds, Savannah Cat and tagged F1 Savannah Cat, F1 Savannah Cat MAGIC by Michael Broad. Bookmark the permalink. Good point. It is unlikely she gets enough stimulation and exercise. She might but I doubt it. You are right Martin. I too have concerns that large cats bred from half wild/half domestic cats don’t get the freedom they need. These cats should never have been bred to be pets, there are millions of small domestic cats being killed for lack of homes. It’s not ideal for any cat to have no freedom but smaller ones can surely adjust better than large ones with wild in their ancestry.